Those of you lucky enough to have gone hands-on with the Switch at one of Nintendo's recent public events may well be concerned about the robustness of the console's kickstand, especially after seeing this post on Reddit which shows the stand popping clean off when placed into the dock. However, we're happy to report that the kickstand is actually designed to disengage from the main Switch unit when force is applied; it can then be re-clipped back onto the console. Given that we're all likely to try and dock the console with the kickstand open at least once during our ownership of the machine, this is good news. What do you think? Let us know with a comment. Well that is a relief! Good to hear it can "stand" a good "kicking"
I think the issue remains if it'll still work as a kickstand after multiple snap-offs, or if it'll loosen the attachment so much that it no longer works. Don't get me wrong, I'm glad this is an intentional design. I just hope it's still as usable on day 1000 as it is on day 1, y'know? The Switch is going to be terrible to play on a plane when turbulence kicks in, LOL. I heard the joint of the kickstand was magnetic? Is that true? "Given that we're all likely to try and dock the console with the kickstand open at least once during our ownership of the machine"
Really? I actually highly doubt I'll ever do this. Often unappreciated it's these little intricacies of design built into the aesthetics that show you how far console gaming has come. It also shows you how much care and afterthought has gone into the product not only from an ergonomic point of view - but the guts of the system itself, much like the WiiU, is impressive in it's power management. This is a company that is conscious of the user, environment and overall experience. The kickstand I suspect is just the tip of the iceberg. Nintendo really keen to avoid another "Wiimote killed my TV" controversy. Everyone can stop being alarmists now. Most of the alarms were foolish from the start anyway. Nintendo is accounting for the stupidity of the human race. Playing Nintendo Switch in handheld mode whilst driving is not recommended! Please use the kickstand provided and place on your dashboard. Place each joy-con on either side of the steering wheel not forgetting to use the straps provided to prevent injury. I like it when flimsy bits are designed to be detachable like that. As long as their connection to the unit doesn't wear out and gets loose. The two click covers on the Wii were detachable too, and they quickly wore down and started feeling as cheap as they probably were. I heard from one review that Switch stand scratches tablet screen and back. It has no soft cover or protection. So be ready. Why would you design something to deliberately fall off? @Marios-love-child I guess because if it didn't fall off automatically the plastic would snap and break instead if enough force was applied, leaving millions of fanboys disdraught. Now that would be a silly design flaw. @Marios-love-child Because accidents happen. If it wasn't designed to come off, and the kickstand did snap off from a fall or whatever - there's no going back. But now we know it's been designed with this in mind, it's not as much of an issue. Just pop it back on again. No harm done. I've got a feeling it'll be the same story that it's been for my 3DS pens all over again, them wearing down, to the point where they just fall out of my 3DS and I have to constantly hold them down . But maybe I'm lucky, since I'm unlikely to use the stand that much. good. it'll make the cable of the microsd to external flash drive adapter easier to integrate. That's convenient. Nice forward thinking on Nintendo's part. @Plainsville Would you not just play it in handheld mode? Nintendo had always design their product with flaws completely resolve in most of their product. I had never bought a Nintendo product I didn't like, even the most hated Virtual Boy was design with quality care despite the awful experience of trying to get use to the system. Um, noooooooooo. I don't think "we're all likely" to dock it with the kickstand out. Some of us pay attention. What if people want that satisfying snap when they dock the system? @gcunit I mean, a big point Nintendo has made is how on the plane, you can set it up on the table and use your controllers independently. I'm just saying that probably won't be the best idea, haha. @Plainsville Yeh, I know I was just making the point that, should turbulence strike, you don't actually have to play in table-top mode, you can just hold the thing. 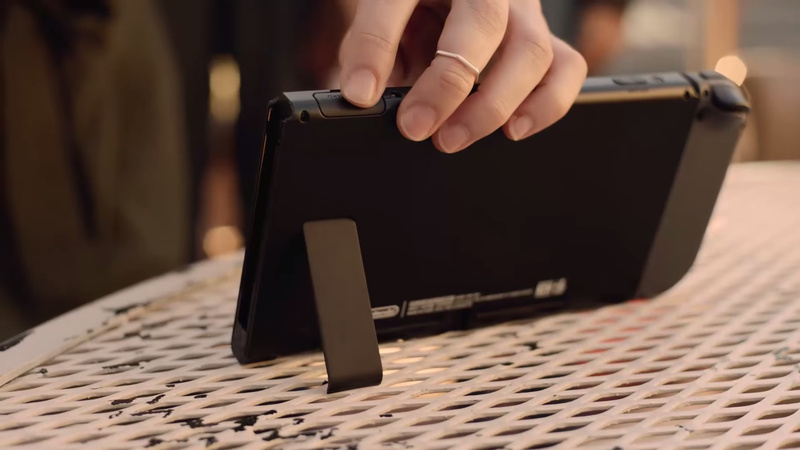 I expect to see the Kickstand listed on the Nintendo UK Store for purchase. You know this is going to go missing, it's just too flimsy. It's going to wear out like the styli. Use Wii U Gamepad Stand to stand your Switch. Problem solved. I also use Wii U Gamepad stand to display my 3DS XL inside my shelf. @Plainsville you mean like the use case they provided in their October reveal? Yeah, agreed. @JudgeMethos @BenAV So you've never messed up in your lives? Not even once? Before you answer, someone who knows you will be rolling on the floor having a big laugh if you answer in the negative. And just to not entirely crush your egos, it might not even be you who makes this error with your Switch, but a friend or family member. Perhaps this is what Soundgarden were singing about in the 90s; the visionaries that they are. It's good news that ninty considered possibilities with the kickstand in advance. I also hope the joy cons are durable. @eeyore Smells like BS. The use of capacitive touch tech instead of resistive in the Switch means that Nintendo can finally use a Gorilla Glass screen (I assume) like the rest of the world instead of the plastic on the 3DS and Wii U, and Gorilla Glass is specifically designed to be so hard that it just. won't. scratch. As an aside, phone cases are such a gimmick; you couldn't scratch a phone's screen with a set of car keys if you tried. Unless the stand is made of razor blades and you can tangibly feel the Switch grinding as you apply force to push it in, there's nothing to be worried about. @Qun_Mang Never said that I've never messed up in my life, I have plenty. Just this particular mistake isn't something that seems likely that I'd do. I'm sure it might happen to some people here and there but I would have thought it'd be a minority of people, not basically everyone. "good. it'll make the cable of the microsd to external flash drive adapter easier to integrate"
Lol holy crap you're really gonna try that? I saw the microSD to SD ribbon cable adapters they sell for building PC's, and I actually thought about it, but don't want a 4" ribbon hanging out of my microSD slot. Would have to fold and tuck in behind the kickstand and tape it somehow. Rather just roll with 256gb and upgrade when the 512gb drop next year. @BenAV 'Sokay. My reply was probably a little over the top. But it is something that really can happen to anyone. Even those who read about this and are careful initially can easily let things slide later on as they get comfortable with the system, or maybe sometime the kickstand won't be in entirely and will catch on the dock and you won't notice until it's too late though you're carefully sliding it into the dock's opening. Even if careful is your norm, maybe one time you're with a group of friends and your attention is on several things at once and... Anyway, as I mentioned, it doesn't even have to be you that is careless- anyone who touches your system could run into this. Nothing on you, but these are just a few examples that show even if you are careful things can happen. That is all. I think something not breaking is good. @Qun_Mang You're right, it can. Not trying to say that it definitely won't happen, just that I think it's unlikely. Unless the kickstand gets really loose and starts opening by itself for some reason, but at that point I'd probably get annoyed with it and want to snap it off anyway, haha. @JaxonH yeah, i've seen those and i guess we were both already looking for ways to expand beyond 256gb. the microsd to sd card option was something i was considering since not only are there sd cards with higher capacities and speeds, tehre are sd cards with wi-fi. those can connect to a wireless drive. the otehr option is to get something like this thing but to sdxc standards. Gotta love Nintendo, always thinking of the little things. Certainly a relief. Just bought the Switch today, and that kickstand... It's an amazing system. I love it. The kickstand is nothing but a micro SD card cover to me. I legit wasn't sure if it WAS meant to be a kickstand at first. It's just clearly a cover that Nintendo wants me to use for other stuff. @Keatonrobards Have you contracted support? That sounds like something I'd worry about, especially if you've got a high-capacity micro SD card in there. @eeyore ... What? How would the kickstand scratch anything?